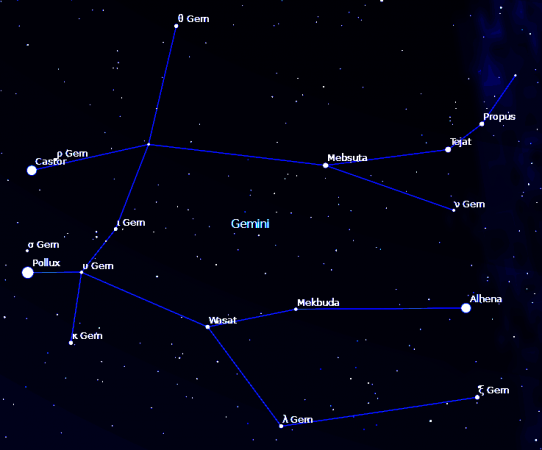 Gemini is the easiest zodiacal constellation to identify. Symbolized by the twins, its stars form a shape that looks like two stick men holding hands, with its two brightest stars, Castor and Pollux, as the heads of the twins. Both the constellation and the astrological sign of Gemini are all about duality and the legends and myths associated with the constellation highlight that fact. Gemini is one of the brighter constellations in the night sky. It does look like two people, or twins, standing together, and its distinctive shape capped by its two brightest stars, Castor and Pollux, make it easy to spot. Though the twins get lost in the glare of the sun and can't be seen during the late spring and early summer in the northern hemisphere, or during late autumn and early winter in the southern hemisphere, it lights up the early evening sky from January until May. January and February are the best time for observing the zodiacal constellation of Gemini in both hemispheres. During this time, it's at its highest point at about 10 pm local time no matter where you live around the world. Locate Orion. Once Orion is found in the southern sky of the northern hemisphere, Gemini can be seen North-West of Orion. 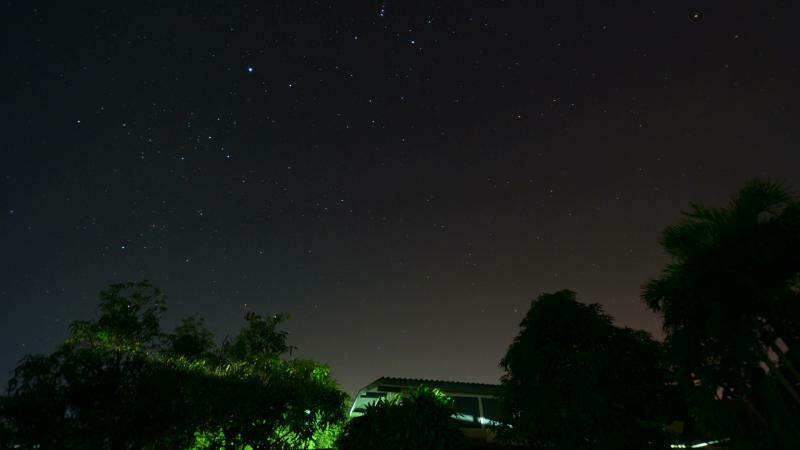 Find the Big Dipper, then locate the stars in the cup of the Big Dipper. The star that joins the cup and the handle together is the one that will help you find Pollux. From there, draw and imaginary line from the cup and the handle; continue along this same line, and it will bring you directly to Gemini. Of course, if you're not an experienced skywatcher or star-hopper, the very best way to locate Gemini is to get a star map that's set for your specific sky watching location. Starmap, available at the Apple App Store, can turn your smartphone into a constellation finder. Skyview app allows you just point your iPhone at the sky to identify stars, constellations, and satellites. In the ancient past, the signs of the astrological zodiac lined up with the zodiacal constellations, but due to the precession of the equinoxes, this is no longer true. From an earthly perspective, the sun passes in front of the zodiacal constellation of Gemini from approximately June 21 to July 20 and is in the astrological sign of Gemini from about May 21 to June 20. When the sun is in the astrological sign of Cancer, its backdrop is constellation Gemini. Twelve of the constellations bear the same names as the astrological signs, but the two are not the same thing. Constellations are groups of stars as seen from Earth. Astrologer/astronomer Ptolemy's 1515 Almagest, listed 48 constellations. The boundaries as known in the 21st Century were defined by The International Astronomical Union (IAU) in 1930. The zodiacal constellations are the 13 constellations that touch Earth's ecliptic. The astrological zodiac is based on the changing of the Earth's seasons. It divides the ecliptic into twelve 30-degree segments of space. Each of the 12 signs of the astrological zodiac marks a 30-degree arc of space along the Earth's ecliptic. 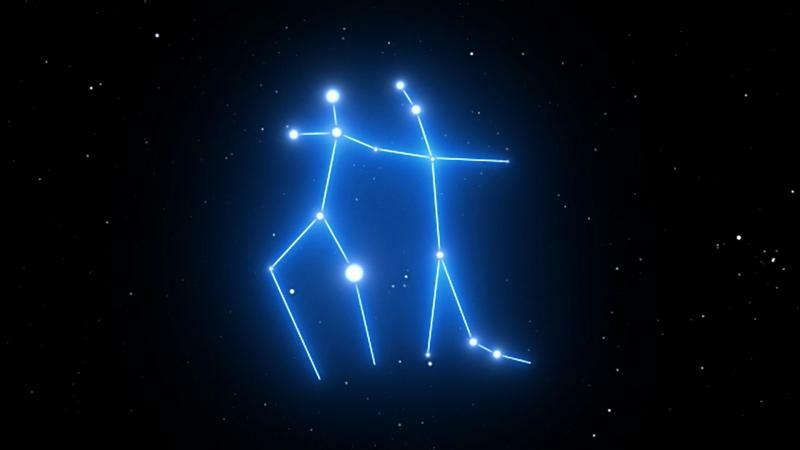 Though not the same as the signs of the astrological zodiac, the zodiacal constellations are essential to astrology. 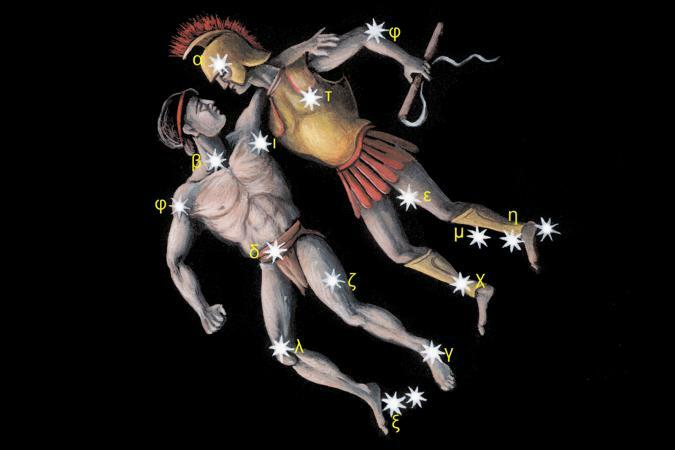 The history and myths of the constellations that touch the Earth's ecliptic helped ancient astrologer/astronomers define astrology's twelve signs, and all thirteen constellations give an added under-layer of meaning to a modern astrologer's astrological interpretations. The early Persian Muslim astrologer, Albumazar, held that the constellation Gemini portended genius, a largeness of mind, goodness, and liberality. The emphasis on an openness of mind is echoed in the astrological sign of Gemini's mutable (ever changing) air (mental) nature, and by its ruler Mercury, the messenger planet that's always on the move. Gemini is the sign of the thinking man who is open to a variety of topics, ideas, and opinions. It's inherently dualistic, curious, mental, and non-emotional. The fixed stars move about one degree every 70 years. Not all astrologers use them, and some use only a few, but those who do use them find them valuable in adding depth of meaning to their interpretations. If the sign and degree of a fixed star are conjunct or opposite a planet in a horoscope, notably the Sun, the chart ruler or one of the angles, the influence of that star will be emphasized in an individual's life affairs and personality. All of the constellation Gemini's stars are now located in the astrological sign of Cancer. The constellation Gemini's brightest stars are Castor and Pollux. These stars are now located at about 20 degrees (Castor) and 23 degrees (Pollux) of Cancer. Castor, the mortal twin, "gives distinction, a keen intellect, success in law and many travels, fondness for horses, sudden fame, and honor but often followed by loss of fortune and disgrace, sickness, trouble and great affliction. Its natives are said to be mischievous and prone to violence." Pollux, the Immortal twin, "gives a subtle, crafty, spirited, brave, audacious, cruel and rash nature, a love of boxing, dignified malevolence, and is connected with poisons." Those with Castor conjunct their Cancer Sun are, "Skilled with language, a profession linked with writing and communication. A storyteller, a poet or songwriter, one who loves to learn. Speech is given, a writer is honored." For example, journalist, screenwriter, director Camron Crowe, and the accomplished comedian, actor, and director Cheech Marin both have Castor conjunct their Cancer Suns. Pollux conjunct a Cancer Sun indicates a person that will, "Choose the path of greatest challenge, greatest growth, the path that wrestles with obstacles. The focus is on a person with different ideas." For example, Angela Merkle and Nelson Mandela both have Pollux conjunct their Cancer Suns. Tejat Prior, Castor's left foot, gives strength, eminence, and success. Tejat Posterio, back foot, gives force, energy, power, and protection. Alhena, the shining one, bestows eminence in art but gives liability to accidents affecting the feet. Geminids meteor shower, named 'Geminids' because it appears to radiate from the constellation Gemini, is a yearly shower that seldom disappoints observers. If you're sky watching the Geminids from the Northern Hemisphere, you'll start seeing meteors as early as December 6. The meteors start one meteor every hour or so; however, over the next week they reach a peak of 50-80 meteors per hour on the night of December 13/14. The rate then begins to decrease, and the last Geminids are seen on December 18. Many astrologers believe meteor showers sprinkle the Earth with something new related to the energy of the constellation from which they radiate. In this case, some new ideas will rain down on the Gemini area of every individual's birth chart. Different cultures have different stories that relate to the constellation Gemini and its two brightest stars. In China, it was associated with Yin and Yang, the dual forces of nature. The twins are mentioned in ancient Persian texts, as well as in Babylonian astronomy. The Romans correlated it with twin brothers named Romulus and Remus. To the Greeks, it was twin brothers named Castor and Pollux. One story says Castor and Pollux, along with their twin sisters Helen and Clytemnestra, were hatched from an egg laid by their mother Leda the Queen of Sparta after Zeus, disguised as a swan, seduced her. Another story says they had different fathers. Pollux, whose father was Zeus, was immortal, and Castor was mortal because his father was Leda's husband, King Tyndareus. Different fathers or not Castor and Pollux were the closest of brothers; they never left one another's side. When Castor was killed, Pollux, the immortal of the two, was overcome with grief and begged his father to grant half of his immortality to his brother. Zeus then transformed them into the constellation Gemini, and twins would spend half of their time in heaven, and the other half in the underworld. This explains the twin's disappearance from the sky at certain times during the year. There's some debate about who the father of Romulus and Remus was. Some say it was Hercules. Others say their mother, Rhea, was a Vestel Virgin who was raped by an unknown man and claimed her pregnancy was a divine conception. Another story says Rhea was married to Mars, the Roman god of war, and Romulus and Remus were their twin sons. In one myth, King Amulius imprisons Rhea and ordered a servant to kill her twin boys. The servant, taking pity on the twins, set them adrift in a basket on the river Tiber, where they were found by the she-wolf, Lupa. Lupa took them as her cubs and suckled them. When they grew larger, Lupa left them where they could be found by a shepherd. The shepherd and his wife adopted the twins, and they grew to adulthood herding sheep. As adults, Romulus and Remus decided to build a new city, which lead them to quarrel about the location. After consulting an augury, they remained at an impasse and continued to argue. The fighting finally came to an end when Romulus kills Remus and became the founder of Rome. The astrological year begins when the Sun enters Aries, represented by a ram. The sun then moves into Taurus, represented by a bull. After Taurus comes Gemini. Gemini is the third sign of the astrological zodiac and the first sign of the zodiac that is represented by a human. It's not just one person; it's twins with two separate minds. Gemini is the dual-natured, ever-changing, mental, astrological sign. It's the sign of Gemini that stimulates the concrete mind to make a distinction between the self and not self.